The District of Columbia is right across the Potomac River from Arlington, Virginia, where REVITALIZATION is based. As a result, I (Storm Cunningham) have seen the breakneck pace of revitalization that has revived many severely-distressed parts of Washington, DC over the past decade or so. For the most part, each of these areas—such as the Southeast and Southwest waterfronts—were in desperate need of redevelopment, and this trend is to be celebrated. But gentrification is rampant. As described in the Resilient Prosperity Guide—and in many previous articles here in REVITALIZATION—gentrification (defined as displacement of long-time, lower-income residents)—is a natural outcome of revitalization. After all, increased property values is a central goal of almost any revitalization initiative. Cities evolve, and change is often painful. But when displacement is excessive—or excessively painful—that’s a failure of government. Excessive gentrification is revitalization done badly. Too many cities feel (mistakenly) they have no bargaining power, and give private redevelopers far more control than is necessary appropriate. Elected officials are often so terrified of scaring away private investment that they forfeit their responsibility to protect the rights of lower-income residents. Some say that’s what’s been happening in the District, as evidenced by the lawsuit filed against the city. Shanifinne Ball is unemployed and cares for her elderly uncle in a trendy, fast-changing part of the U.S. capital. Although she expects eventually to take over her uncle’s home, Ball is anxious she could be forced to move out of the area as rents continue to rise. Ball is particularly worried by a new 6,000-unit development going up just blocks from where she lives, part of a massive revitalization project that has transformed the Union Market neighbourhood she lives in. In so doing, the city has overlooked the impacts of these policies on the poorer, often African American neighbourhoods, even when courts have directed officials to take into account “adverse impacts” such as gentrification, according to the attorney bringing the lawsuit. He said the lawsuit is the result of three years of planning decisions during which he said he found a pattern of “questionable decisions“. In addition to Ball, the lawsuit names two other individuals and the members of an African-American community-development programme, all of whom have testified about gentrification and related issues before city planning officials. “Some neighbourhoods are essentially unrecognizable to those who live there, as centres of cultural and economic life in communities of colour have basically been completely transformed as white younger urban professionals have moved in,” Zippel said. Entire neighbourhoods have changed rapidly, irrevocably affecting longstanding social networks — something that Theresa’s lawsuit says the city is legally required to consider. The effects of these changes, experts said, has altered the racial composition of some neighbourhoods drastically. The neighbourhood of Columbia Heights, for instance, saw its white population increase by 330 percent between 2000 and 2010, said urban planning scholar Kathryn Howell, an assistant professor at Virginia Commonwealth University. “Certainly that’s in part because the white population had been so low, but the reality is a huge shift visually: not only of the built environment being blown apart but also in terms of who’s there,” said Howell. Her work has shown a resulting shift in power and norms of behaviour in such situations, too, as a new population is suddenly living in dense urban areas. “There are lot of kinds of displacement, including social and cultural, which means the things that you think are safe and normal are perceived by new and white residents as unsafe,” she said. 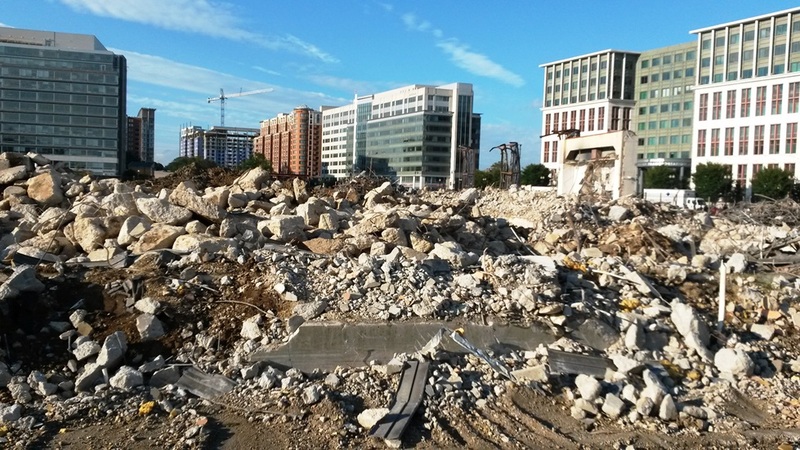 Photo (by Storm Cunningham) shows 2014 demolition along DC’s southeast waterfront on the Anacostia River. This was, for the most part, redevelopment of an old U.S. Navy base, and so involved minimal displacement of long-term residents.